Margaret June Carlson, of Kalamazoo, MI passed away on Tuesday, April 4, 2017 at the age of 95. June was born on December 27, 1921 in Omaha, NE. She was the daughter of Charles and Margaret (Duffield) Bryant. June graduated from Howell High School in 1939. She married the love of her life Robert Carlson on September 14, 1941. 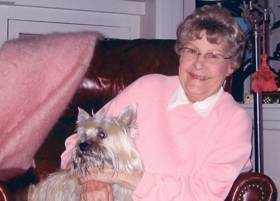 Left to cherish June’s memory are her children: Maggi (Roger) Weinberg; grandchildren: Chad (Danielle) Weinberg, and Lars Rasmussen; and furry companion and best friend, Thistle. She is preceded in death by her husband of 64 years, Robert; and her daughter Carrie Carlson. Per June’s request, cremation has taken place. Please visit June’s webpage at www.lifestorynet.com where you can archive a memory and sign her memory book online. Those who wish may make a contribution to the Kalamazoo Gospel Mission.